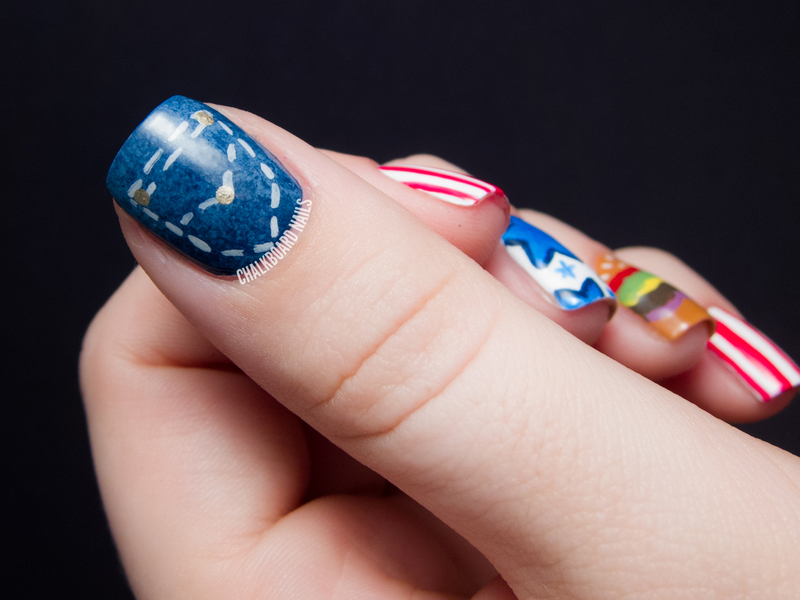 This year, when deciding what to do for my Fourth of July manicure, I fondly recalled the two looks that I did last year (Stenciled Star Gradient and America the Glittery). This year, I wanted to do something a little more challenging but with the same amount of awesome. I think I succeeded, and I even tried to add a little bit of humor, too! 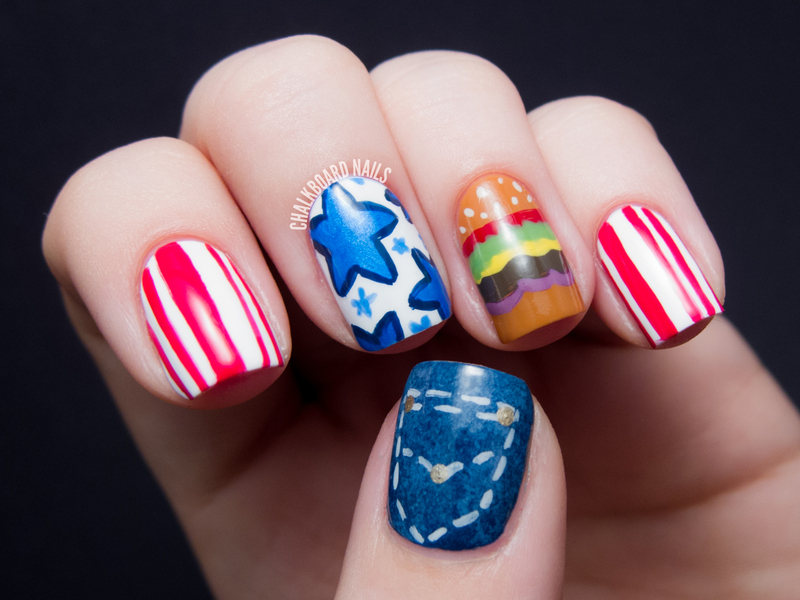 I obviously wanted to include red, white, and blue in the manicure, but I also wanted to add in some unusual accent nails as well. The first thing that came to mind was a cheeseburger, because what's more 'MURRICAN than a good ol' burger? I like mine with lots of onions and pickles. Blue jeans are pretty American, too, so I tried to create a denim pocket as my second accent nail. I started with a base of China Glaze First Mate, and then used a rough sponge to add a layer of China Glaze Secret Periwinkle. I did one more sponged layer of First Mate and finally one last layer of Secret Periwinkle to create that perfect denim finish. I painted the stitching on with white polish and added the rivets in Essie Good As Gold. The last details are the stars and stripes! The stripes were painted on with American Apparel Downtown LA, & the stars have China Glaze Splish Splash as the centers and American Apparel Mount Royal as the outlines. I got a little lazy when it came to doing my right hand... Sean totally called me out on it! But whatever, I like they way they look together and it fits with the two accent nail theme. The pointer is wearing Jindie Nails Blue Ivy and the glitter on the thumb is an old Milani Jewel FX. Happy Fourth everyone, be safe! These are so cute! especially the sesame seed bun! That is a gorgeous mani that you have there!!!! Congrats on the sick job!!! Wow! And that burger ;) wicked idea!!! Great job!! This is sooo cute!! I actually channeled you and bought a star hole punch from Micheals to do some nail art interspersed with studying, lol! Wish me luck and Happy 4th!! Awesome! You should post a pic on the CN Facebook when you're done! Sarah this many is usper cool! Happy 4th of July! Haha.. this mani made me smile. 'murica! 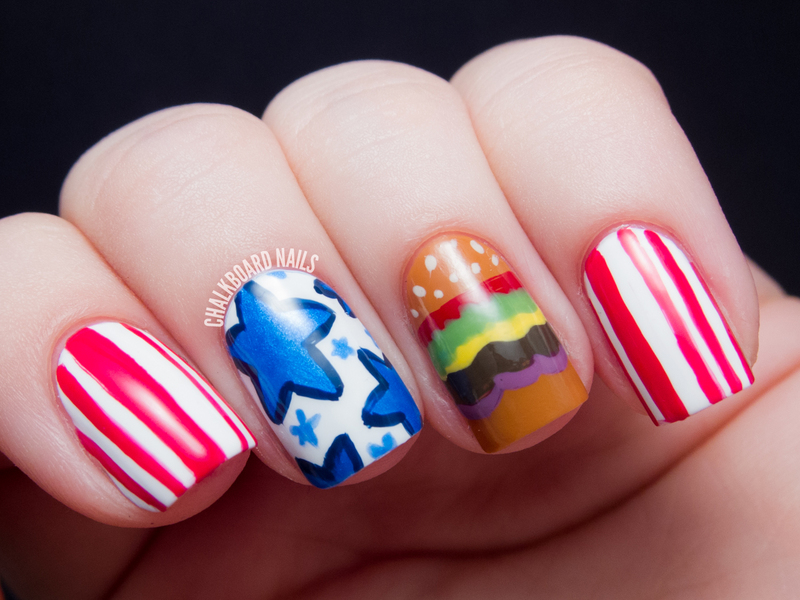 Hehe, now that's a very American mani :) Looks great, I especially like the jeans pocket! 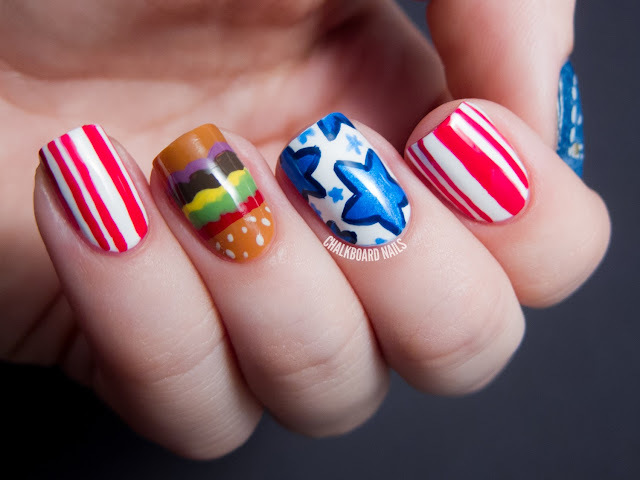 I love the burger! So cute!! 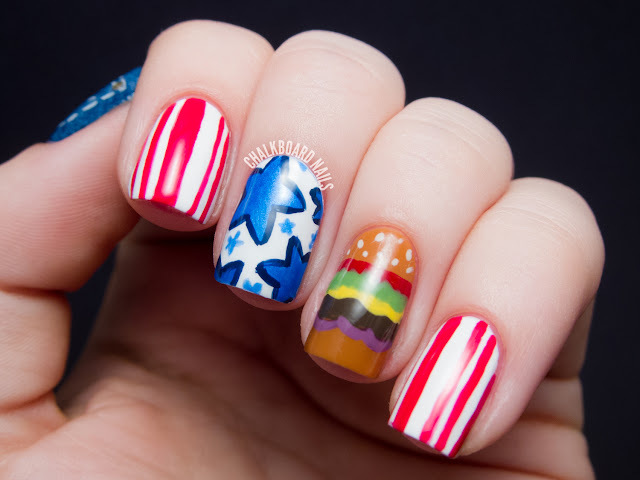 I love the hamburger accent nail! the burger reminds me of a krabby patty! my bf also calls me out when it comes to nail art on my right hand. 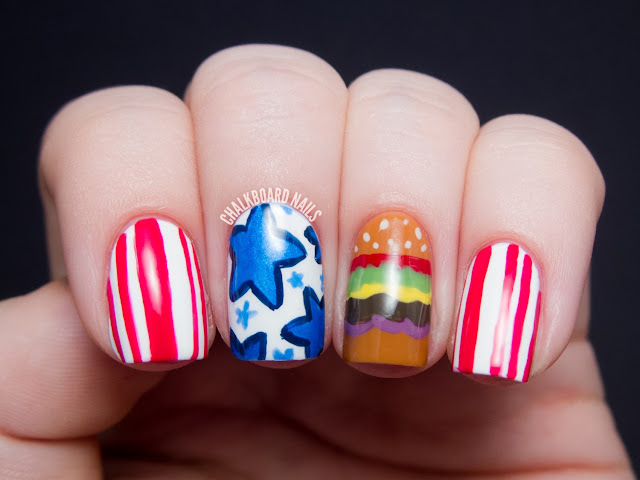 Love the burger!!!!!!! :) looks so good I could eat it!